It is well known that smoking and sun exposure can damage skin, but did you realize alcohol consumption and nutrition also play a role in your skin’s health? We all do our best to protect our skin, but inevitably, time takes its toll. That’s why the Edgewater Med Spa is dedicated to giving you that extra added advantage in making your skin look and feel its best. Dr. Khan, a board-certified surgeon and head of the Edgewater Med Spa cares about your skin. This is why the Edgewater Med Spa offers so many treatments to enhance your skin’s natural glow or remove unsightly spots or wrinkles. Dr. Khan’s practice is fully comprehensive in its offerings for every skin type and condition and now offers the DOT Laser Skin Resurfacing Edgewater beauty-conscious women have been seeking. DOT Laser Skin Resurfacing is a revolutionary way to reduce the appearance of wrinkles and other unwanted skin conditions. What is DOT Laser Skin Resurfacing? Using the best DOT lasers on the market today, Dr. Khan and his associates simply remove damaged surface skin in order to reveal the new layer underneath. This procedure restores the skin’s youthful, healthy glow, but that’s not all. It can be used to eliminate fine lines, wrinkles, acne scars, brown spots and other troublesome skin conditions. Because this ultra-modern technology uses DOT lasers, not chemicals, it can reach the deeper skin layers neglected by procedures such as microdermabrasion and chemical peels. Best of all, patients report no side effects to this non-surgical, minimally invasive procedure. The DOT Laser Skin Resurfacing Edgewater women are talking about tends to vary in its treatment time from a few minutes to two hours. It all depends on the size of the area you decide to treat. Downtime is minimal for this procedure, so that means regular activities can be resumed within a day or two, although you should also avoid sun exposure during the healing process. 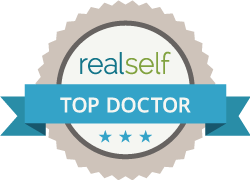 As a board-certified surgeon with a specialty in cosmetic dermatology and aesthetic surgery, Dr. Khan is able to offer far more procedures than a typical clinic run only by aestheticians. This means that DOT Laser Skin Resurfacing can be combined with other procedures, if needed, to get you the optimal result. Why should I get DOT Laser Skin Resurfacing from the Edgewater and Hoboken MedSpa? The Edgewater Med Spa’s Dr. Khan offers Edgewater women his 15 years of experience in the field of cosmetic surgery and cosmetic procedures. As a fellow of the American College of Surgeons as well as the American Society for Laser Medicine and Surgery, Dr. Khan is well versed in the technical skills involved with DOT Laser Skin Resurfacing, but also has an artist’s eye. If you want beautiful, natural-looking results and a qualified physician who carefully listens to your needs and understands your expected outcome, choose Dr. Khan and the Edgewater Med Spa. We strive to provide the highest quality of results for all of our procedures, which is why we’ve been named Best Skin Care in Edgewater. Let our skilled doctors at The Edgewater Med Spa reverse the signs of aging with DOT Laser Skin Resurfacing. The initial consultation is FREE. Call 201.313.8899 to schedule your appointment to learn more about DOT Laser Skin Resurfacing today!